One of the most iconic asterisms in northern skies is the famous “W” Cassiopeia the Queen. Mythology states she was extremely vain and with the help of King Cepheus, was about to sacrifice their daughter Andromeda to appease the god. But the tale is not bleak as she was saved by Perseus. The five bright stars that make up Cassiopeia can be seen any time of year from Canadian soil as this is a circumpolar constellation. Cassiopeia has a bit of everything for your sampling. This moderate sized constellation consists of 598 square degrees of sky, it ranks 25th in size with regards to other constellations. The middle star of the “W” is called Gamma Cassiopeia located 610 light years away is termed a shell star or a star with a disk of gas around its equator. This spectral type B0 subgiant sun has an estimated surface temperature of 25,000 degrees K and some 40,000 times our Sun’s luminosity. It does exhibit irregular variations in brightness from magnitude 2.2 to 3.4. With a mass of 15 times that of our Sun, it will surely go supernova at some point. Moving down towards the star Shadir, we come across the double star Achird. Located only 19 light years from us, the pair is separated by only 13 arc seconds and comprised of a yellow G2 star at magnitude 3.4 along with an orangey-red dwarf class K star at magnitude 7.5. Between the magnitude difference and colours, Achird is a must on your observing list. 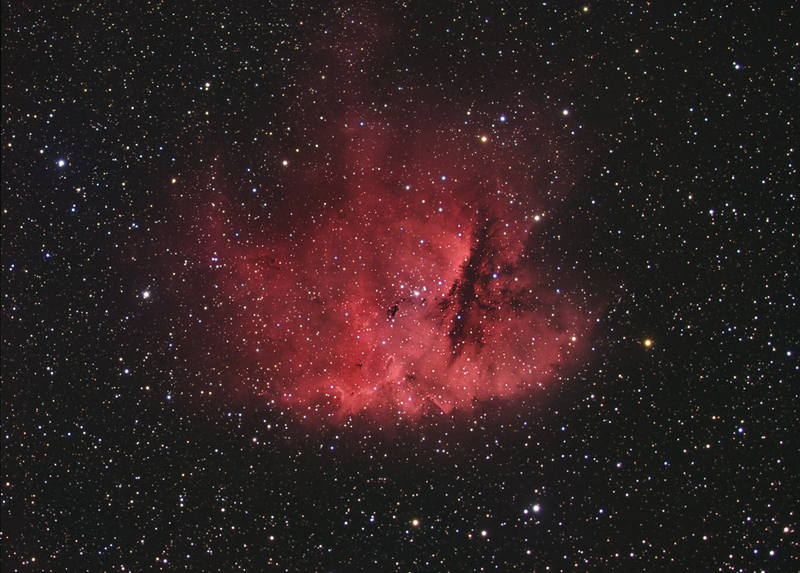 Not too far from Achird is NGC 281 or the Pacman Nebula. Here we see an emission nebula some 10,000 light years from us that has an embedded open cluster of stars. Many dark clouds called Bok Globules are also present. Rho Cassiopeia is a huge star. Classified as a hyper giant star, it has a diameter of 630 million kilometres with an orbit that would almost reach Jupiter if it replaced the Sun in our solar system. It also varies from magnitude 6.2 up to magnitude 4.1 in about 320 days. This monster star is located 8,200 light years from us with the brightness of half a million Suns. 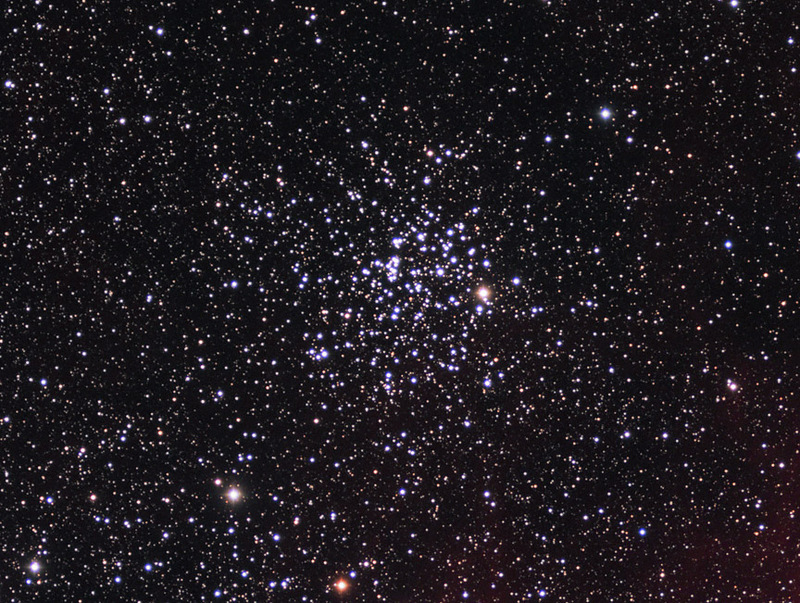 M52 is the brighter of the two Messier objects that occupy Cassiopeia. 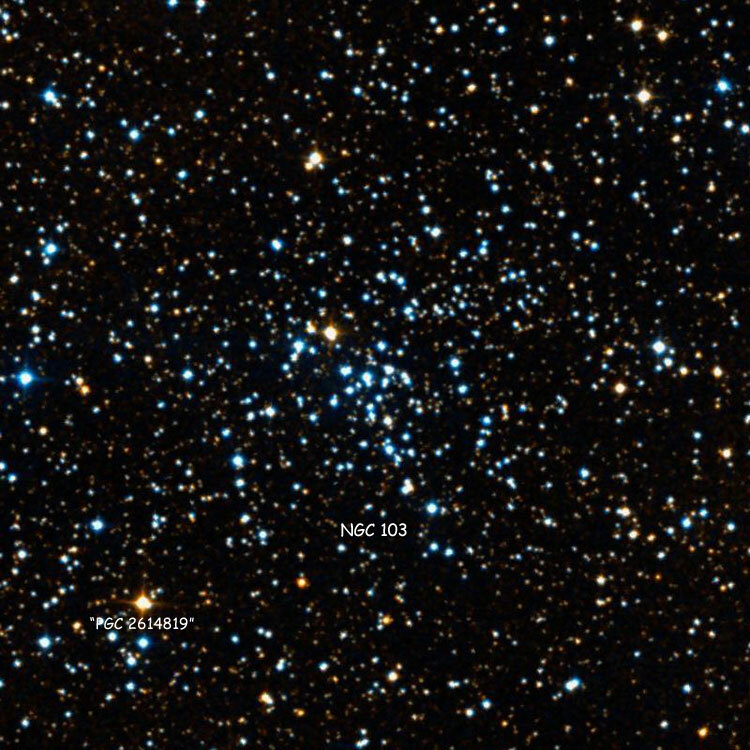 Binoculars are required to spot this magnitude 7.2 open cluster which is home to some 200 stars. Estimated distance is between 3,000 and 7,000 light years away. The other Messier is M103 which seems to only have about 40 stars. M103 is just a bit fainter than M52. Two meteor showers are scheduled for this month. First we have the north Taurids with an hourly rate of 5 per hour on the night of the 12th. Leonid meteor shower peaks on the morning of the 17th. The weak shower will produce about 15 meteors per hour but with the 95% waning gibbous moon lighting up the night, it might be disappointing. The planets Mars and Saturn are sinking lower into the west. These two worlds, the brilliant planet Venus and a 15% lit will form a fantastic conjunction on November 3 less than an hour after sunset. The secret is to find a clear south west horizon. The mighty Jupiter is back in the morning sky and very visible before dawn. The full Beaver Moon occurs on Nov 14 and is the closest perigee of the year. New moon (lunation 1162) will be on the 29. And lastly Daylight Saving Time ends at 2 a.m. on Sunday Nov 6. Clocks fall back one hour if applicable in your time zone.